Federal Skilled Trades Class category Candidates who were qualified in Express Entry, and candidates having an enhanced provincial nomination, were successful in the draw held on November 1st. 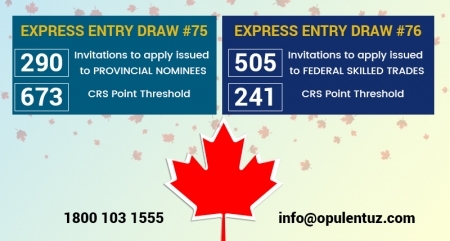 As a result, IRCC has invited FSTC candidates, deemed successful after scoring 241 CRS points, to Apply for Canada PR status. The cut-off threshold for Comprehensive Ranking Score for the provincial nominee candidates was 673 points. The ITA was totally issued to 795 candidates, and among them, 505 were given to candidates of Skilled Trade Classes, and the remaining 290 were given to provincial nomination candidates who had opted for a PNP Stream aligned with Express Entry. The present draw had unique features and had happened for the second time in 2017, that the authorities held a draw of program-specific nature, exclusively for applicants of Skilled Trade Classes and for candidates who were provincially nominated. Being the earliest draw conducted, following the 26 May draw, it attracted the entire set of candidates, figuring in the pool. The features of this draw were similar to the Draw, conducted on 26 May, where provincial nominee candidates and FSTC were invited. By now 10 draws were held, between May 26th and November 1st, and it is facts that, draws which are program-specific, are not the norm, but can be regarded as exceptions. The benefit is given to all candidates, because the authorities eliminate a few aspirants from the existing pool. The persons receiving the nomination from a province and also 673 CRS points, and who figured on November 1st in the pool were invited. The categories included were FST, CEC, and FSW. When FST candidates were sent an invitation on November 1st, it showed that applicants in FSW and CEC will get a chance to add to their rank owing to such a draw. This has made one point clear, that much deviation, was observed in the rank threshold, and program-specific draws, and candidates of varied environments, were sent the invitation to submit an application for PR status. Candidates with no work experience or studies in the country, but possessing a Canadian employer job offer, meeting LMIA requirements, with the ability to speak in English, and adequate exposure to external work, emerged successful in obtaining an ITA. If the candidates had a spouse, who had sufficient language ability, and a bachelor’s degree, were also successful. A provincial nomination awarded 600 points, and helped them in a big way, to submit the immigration application. Including this draw, 140,619 ITAs, were issued from 2015. 75,775 had been given in 2017 alone. It was a surprise draw, for the persons invited, and also showed the dynamism of Immigration authorities. The invitations issued in 2017, were far more than those issued in 2015 and 2016 totally. It stresses the fact that the governments in federal area and provinces think the EE pool to be a rich source of exploiting talents. Several people gain from the schemes, to welcome newcomers in the country. For boosting their opportunity to get success, all aspirants must try the pool and hope for the best.